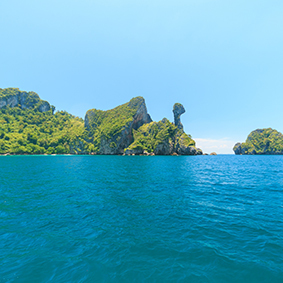 Krabi is famed for its pristine beaches and turquoise waters, but there’s more to see that the coast of this enchanting Island. Delve deep into the last remaining lowland rainforest in Thailand via a 4WD adventure through the topical rainforest. Enjoy an exhilarating ride through the old palm oil and rubber plantations that will lead you to the heart of the lowland rainforest. Once you’ve made it to the center of the forest you will ditch the Land Rover for your walking boots. The walk takes you along the scenic route where wonderful nature trails can be found. You will get the chance to swim in the emerald freshwater pools that are enveloped by lush green trees and the vibrant azure sky. After you’ve cooled off in the freshwater pool you’ll be treated to a picnic lunch where you’ll get some time to relax and unwind. Next stop is the hot springs and the hot springs waterfall before heading out to Krabi’s beloved forest Temple, Wat Seua or informally known as Tiger Cave Temple. The Krabi Rainforest Discovery tour operates all year round each day and lasts approximately 8 hours. The dress code is casual and comfortable according to the weather. 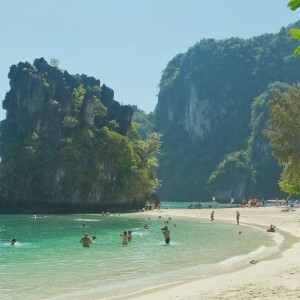 Are you interested in adding the Krabi Rainforest Discovery tour into your Thailand honeymoon itinerary? Contact us for details!